League assignments resume for the lower division rugby squads this weekend as they get in shape for the first BT fixtures of 2017. Premiership teams are enjoying another week’s festive lie-in, but competition in the other divisions gets back underway on Saturday. Among those on League I duty are Jed-Forest and Selkirk, both in the top half of the table and both of whom had some additional match practice over Christmas in the Border League and traditional local tournaments. Third-placed Jed-Forest host Stewarts Melville and are looking very much towards victory. 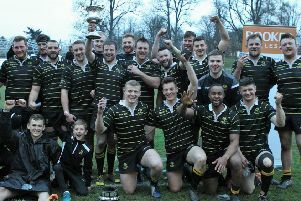 The Riverside Park squad was narrowly defeated 31-29 by Hawick in the Skelly Cup last week but head coach Jammy McFarlane said he could not fault the players’ effort. Gregor Law picked up a shoulder injury but it’s hoped he’ll be fit for Saturday. “There are nine games to go – still a lot of rugby to be played,” added McFarlane. “Hopefully, we can string together a good run – we might actually have to win the whole nine to give ourselves a chance of anything. There’s a bit of pressure there. Selkirk, in fifth, travel to GHA, with manager Tom Ramage glad to have an extended squad and competition for places among the players, as well as the “good, hard workout” afforded by last Thursday’s 27-6 Border League victory at Peebles.